Access to Justice is an Urgent Task | Global Disability RightsNow! Last year in February, I published an article, Without Access to Justice, in my blog, in which I narrated the awkward and outrageous situation that I experienced when, in my capacity as a lawyer, I had to make a visit to the First Criminal Court of Lima located at the headquarters of the criminal courts at the 26 block of Arenales Avenue in San Isidro, Lima, Peru. Some of the drawbacks were the lack of special parking for cars; a main entrance of five steps without a ramp; a "special entrance" consisting of an entrance of five steps without having a view to the street; and a court on the third floor and the elevator in bad condition. Of course, the issue of access to justice goes beyond architectural or physical barriers. The adaptations with regards to technological, communicational issues, and legal accessibility are equally important. Nevertheless, this time, I want to focus my attention on the physical aspect with regards to the anecdote that I had to experience and which motivated me to file a complaint with the Ministry of Justice and Human Rights and before the Ombudsman. In response, the Deputy Minister of Justice invited me to participate as a member of civil society in the Working Group responsible for the topic of persons with disabilities in the preparation of the National Plan for Human Rights--a proposal that I accepted by offering my humble contributions together with a group of well-motivated and recognized activists. We were very careful in addressing the issue of accessibility. On the other hand, it should be noted that within a few weeks, the court was transferred to the headquarters located on Abancay Avenue in downtown Lima, with ramps for the entrance and an elevator working properly. Something that deserves to be highlighted is that the Judicial Branch through the program of Access to Justice for Persons with Disability has adopted the National Plan for Access to Justice for People in Vulnerable Conditions of the Judicial Branch. The five-year National Plan (2016-2021), mentioned above, proposes to ensure the exercise of the human right of access to justice for people in vulnerable conditions without discrimination. This implies identifying the legal barriers in order to remove these obstacles and adopting specific measures to favor the effective enjoyment of this right. In response to this, the Judicial Branch recently approved the Protocol for Judicial Care for Persons with Disabilities proposed by the Permanent Commission for Access to Justice for Persons in Vulnerability and Justice in your Community. What I think is worth highlighting is that the initiative will be applied in the 34 superior courts of justice in the country with the purpose of providing magistrates and other justice operators with the guidelines that will facilitate them to offer correct and effective care for people with disability in general for the full exercise of their rights without any kind of discrimination and in all levels of the system of administration of justice. Likewise, the institution will develop initiatives that promote compliance with the international commitments made by Peru, in order to be critically reevaluated and recognized in the administration of justice and for the improvement of the society. Civil society entities have also provided their contributions; APRODEH (Association for Human Rights) has also published an important analysis on the subject. A protocol of this nature requires goals, indicators and budget; otherwise it will not have effective results and we therefore believe that it should be subject to permanent monitoring and follow-up. Interesting initiatives are already appearing. For instance, based on this protocol, the Court of Justice of Cajamarca, a region located in the northern highlands of Peru, is implementing a program to notify judicial resolutions and sentences in Braille system for blind persons. We hope that the national plans can be implemented and applied successfully and with the help of all Peruvians who want the enhancement of the fundamental rights of persons with disabilities as well as their timely, decent attention on equality of opportunities. The task is not easy; just to cite an example, more than 60% of the Justice of the Peace Courts in Peru are located on high floors in buildings without an elevator. Access to justice is an urgent task. As a legal adviser in the Ministry of Foreign Affairs of Peru, Mr. Vega revises bills and supreme decrees. 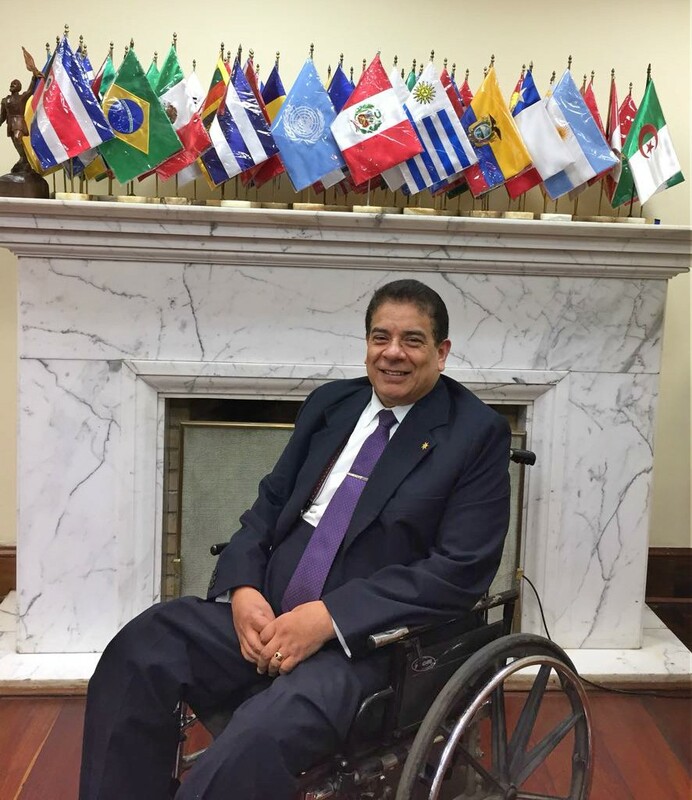 Mr. Vega served on the intersectoral commissions with respect to disability issues and legislation, including the Commission on the implementation of the National Plan for Equal Opportunities and the Commission for the Implementation of the UN CRPD in Peru. He has also served as Advisor to the Disability Commission of the Congress of the Republic. As President of CONADIS, governing body responsible for disability issues in his country and as General Director of Persons with Disabilities of the Ministry of Women and Social Development, Mr. Vega worked in close coordination with other ministries for a cross-cutting approach to disability issues. He has written several articles for magazines and main newspapers of his country promoting the rights of persons with disabilities.